The Eastern Builders Safety Group was formed in 1992 as a direct result of a merger between three existing independent safety groups, the Beds & Herts Safety Group, the Cambridge Building Safety Group and the Central Essex Building Safety Group. The above three Groups had been trading in their respective areas for more than eighteen years, offering a good, solid service to their members, and formulating a strong relationship with the enforcing authorities. However, the continuing problem of member sites encroaching into areas outside the control of the Groups encouraged the merger to be formalised. The Eastern Builders Safety Group Ltd currently has a solid membership base of over 150 construction companies, from the very smallest one-man band to a turnover of £60,000,000, each receiving a service benefiting them from their regional Health & Safety Advisor. As an independent Safety Group, we are members of the Royal Society for the Prevention of Accidents and the British Safety Council. The simplicity of the Group is what makes it unique in the field of health and safety. It offers a complete health and safety service, based on the subscription of its members and revenue gained from additional services. There is no profit margin added! This, we feel gives a service that is personal to all members, and is not dictated by cost and time constraints. Further information on the Eastern Builders Safety Group Ltd. and the service it provides can be obtained from contacting Mark Cooper on 07921 057511. 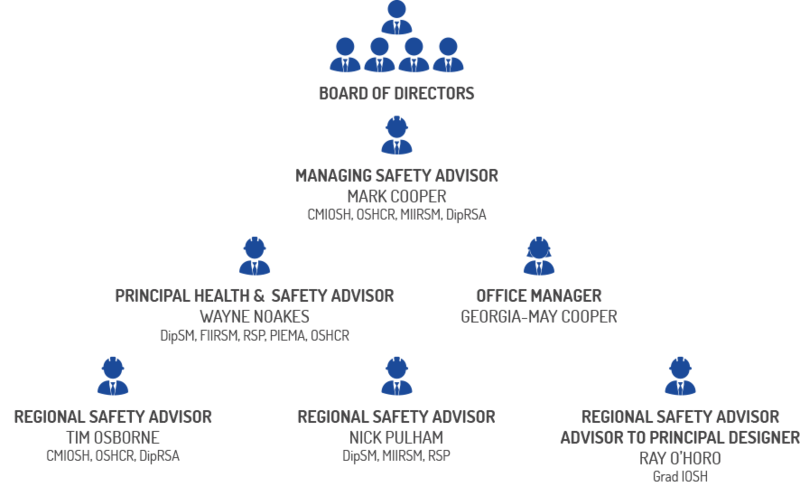 EBSG Safety Advisors are all members of the Institute of Occupational Safety and Health/IOSH or the International Institute of Risk and Safety Management/IIRSM. The Board is made up of five Directors, all of which are Directors of existing member companies. Any Director of a member company, regardless of turnover, is eligible to be elected to the Board of Directors, and will have an equal vote on all issues regarding the Group’s activities. This allows total member involvement in the way the Group operates. The Managing Safety Advisor is responsible for the recruitment of new members, the general management of the Group’s finances and the promotion of the Group throughout the construction industry. He oversees the smooth operation of the Group’s day to day activities, co-ordinating all geographical areas covered by the Group and the Advisors assigned to them. The Managing Safety Advisor also carries out the role of Safety Advisor ensuring a hands on approach is maintained at all times. Assisting the Managing Safety Advisor together with fulfilling the duties of Regional Safety Advisor. All Health & Safety Advisors have a designated area under their control allowing them flexibility to arrange their workload in accordance to demand and risk. Although the core area of their work is site inspections, they also hold regular meetings with members, carry out premises inspections, management audits. As the areas are fairly well defined, a strong relationship is established between the members and their respective Safety Advisor, encouraging health and safety issues to be openly discussed at all levels of member companies. All site inspections are carried out using laptop computers, ensuring that all reports are clear and legible, and are e-mailed to members on the day of the inspection. All the Health & Safety Advisors are qualified to the recognised national standards, and are members of their respective professional associations. The Office Manager controls all administrative issues concerning the Group, and ensures that contact is available at all times during office hours. The Office Manager also processes all site inspection reports carried out by the Advisors. To become a member, the membership form can be completed online. Alternatively, contact our office on 01223 420111 to request a membership pack. Membership is required to fulfil the Safety Group's constituion and legal taxation status.